For those seeking respite from the hustle and bustle of daily life, you will be astounded by Ouray’s tranquility, exceptional beauty and world class outdoor recreation! Ouray is a quintessential mountain town in southwestern Colorado. Often called “The Switzerland of America”, it nestles like a little jewel within a bracket of breathtaking peaks, with world-class outdoor recreation opportunities beckoning in all directions. Ouray and the surrounding San Juan mountain range are home to one of the greatest concentrations of water ice climbs in North America. The range’s steep relief and deep gorges provide a superb venue for ice climbing. Roads carved into the sides of mountains – a legacy of Ouray’s rich mining history – provide stunning access to that terrain today. The mountains around Ouray provide some of the best back-country skiing and ski mountaineering terrain in the Rocky Mountain region. For those of you who want a more refined skiing experience the Telluride ski resort is just about a one hour drive from downtown Ouray. For the Nordic skier, bring your skates or your classics we’ve got you covered! 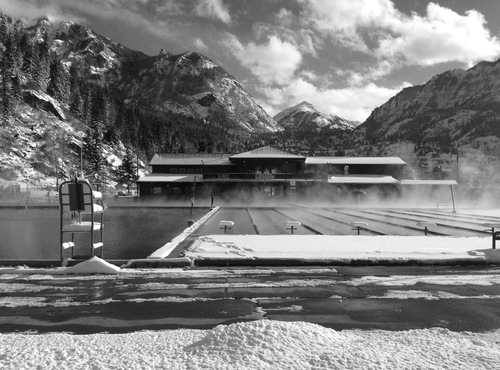 We even have a hot spring to relax in after a day of wintery adventure in the beautiful San Juan’s.